Voodoo Lab Pedal Power supplies set the standard for pedal board power supplies in the music industry. We are proud to carry these amazing tools for making music. Categories: Pedals & Accessories, Voodoo Lab. 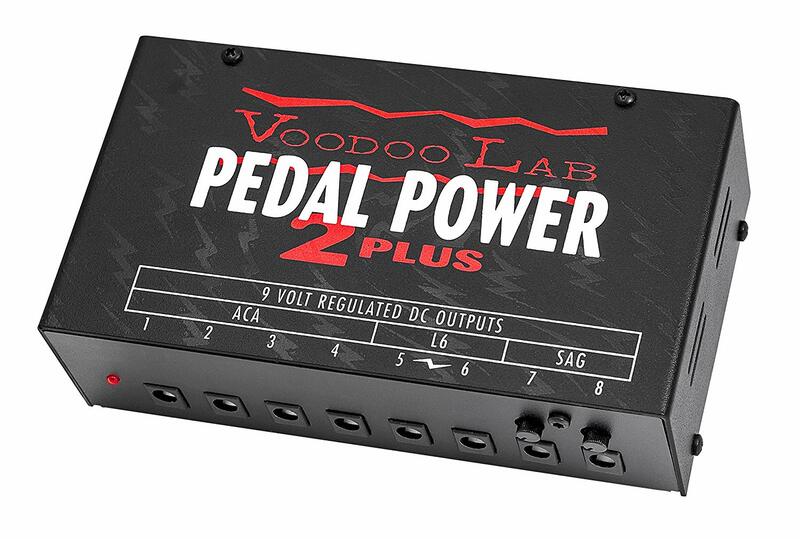 Used by top touring and recording musicians everywhere, the Voodoo Lab Pedal Power 2 Plus is the industry standard isolated power supply for all battery-operated guitar effects. With eight 9V completely isolated, regulated, and highly filtered outputs, Pedal Power 2 Plus will make your pedals sound consistently at their best. A custom designed, ultra-low noise toroidal transformer delivers quiet operation, free of hum and noise. It features two outputs that can be switched to power Line 6 modeling pedals, and two outputs with variable voltage “sag” to emulate dying carbon batteries for nailing that vintage sound in your wah, overdrive or fuzz. Plus, with its isolated outs, you can combine them to create 18V and more! Pedal Power 2 Plus is hand made in the U.S.A. and comes complete with cables, detachable AC power cord, and a 5-year warranty.